As a system supplier specialising in metal turning, milling and additive manufacturing, Toolcraft delivers end-to-end solutions from a single source. The company’s machinery is based on the latest technology to ensure superb quality, from initial contact to the completed order. toolcraft is now once again investing in the future and will take its first step towards Industry 4.0 in early 2016. 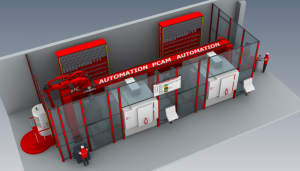 Toolcraft is collaborating with the Swiss company PCam to develop a novel automation solution over a workspace of 80 m². In contrast to typical automation solutions, the robot in this solution travels on a portal above the machines and loads them from above through a hatch. It also inserts the necessary milling tools automatically into the integrated milling tool changer. The benefits are clear, as the design not only saves space, but guarantees flexible machining as well. This is because the operator can still access the Hermle machining centres directly to operate them manually, independently of the automated processes. This flexibility is particularly important when it comes to machining small and medium-sized series. Storing the milling tools externally also has a significant cost benefit, as large milling tool magazines are not needed in the machining centres. The machining jobs are prioritised at the automation system terminal. Components are still programmed in the same way as before, while the automation system’s cell controller accesses the approved machining programs directly and the machining jobs are prioritised at the automation system terminal. The robot automatically fetches the workpiece pallets for machining and the required milling tools from the shelf, loads the machines and starts the machining runs, before returning the finished parts to the shelf. Tools and material are provided and workpieces are removed via the loading and unloading stations, allowing the operator to plan production for when the machinery is unattended. This enables jobs to be processed at the weekend, for example, and the finished parts to be transferred out of the automation system at the start of the following week. The PCamCell software is the system control centre. It plans and controls the process predictively, checking whether adequate material and the necessary milling tools are available to ensure smooth, flexible and consistently reliable production. The automation solution can also be used with existing machines. In fact, the guiding principle of Alex Magnetti, owner of PCam, is “Use what you have”. “Our concept is completely independent of machine manufacturers and machine technologies. 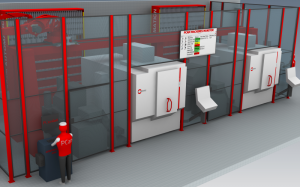 We provide solutions of all kinds, connecting extremely different machines to one another, with or without robots.” The system at toolcraft is also modular and extensible, with plans to expand it already in the pipeline. “It can also be linked to our ERP system, which would enable the software to determine the machining sequence fully automatically in line with our delivery deadlines,” says Christoph Hauck. That would represent yet another step towards Industry 4.0.